Ask Adrianne Haslet-Davis and she’ll tell you that she’s not a victim. She’s a survivor. The ground began to shake. People began to run. And a smothering, thick smoke poured over Boylston Street. Thirty-two-year-old professional ballroom dancer Adrianne Haslet-Davis quickly covered her eyes and turned away from the blast. Then, a second explosion knocked her to the ground. She landed in a fetal position, her eyes still open. When the smoke finally began to thin, she realized that she was bleeding heavily. And that much of her left ankle and foot was missing. 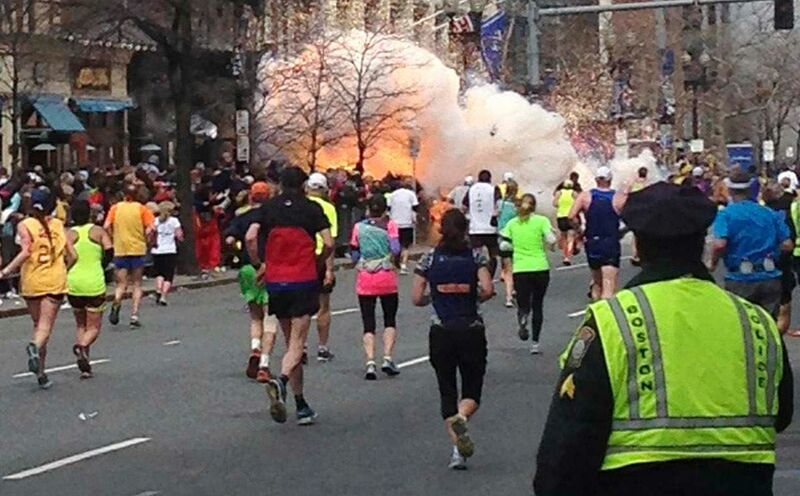 Haslet-Davis was one of the many bystanders at the Boston Marathon bombings — the April 15, 2013, terrorist attack that killed three people and wounded at least 264 more. And while the precise timing of the events is hazy, she says she can still recall nearly every detail of the immediate aftermath. Taken to the nearby Boston Medical Center, the dancer had to have her left leg amputated below the knee. Immediately, she knew she was facing a long road ahead. Not only would she suffer from post-traumatic stress, but she would quite literally have to re-learn to walk, this time with the aid of a prosthetic lower leg. But just a week after she came out of surgery, when one could’ve hardly expected a positive thought from her recovery room, she made a promise to herself: that, no matter what, she would dance again. Now, 36 months later, not only has Haslet-Davis foxtrotted once more, but this Monday she will be returning to Boylston Street — this time as a runner in the 2016 Boston Marathon. She pledged to participate in October 2015, just six months ago. And while training for Marathon Monday would surely be her most taxing physical challenge to date, it also, more significantly, marked the biggest mental hurdle Haslet-Davis had attempted to jump since tragedy struck, as she prepared herself to face the fears that were born at Mile 26 on that spring day in 2013. During her hospitalization, she met MIT Media Lab director Hugh Herr, a double amputee himself who specializes in bionics. After speaking with Haslet-Davis, Herrpromised to build her her own bionic limb, developing it specifically to mesh with the “fundamentals” of, flexibility needed for and movements inherent to dance. Just 200 days later, Haslet-Davis, donning a white dress, white shoes, an updo and a prosthetic left lower leg, stepped onto a stage and began to dance the rumba. It was the tearful, triumphant climax to Herr’s March 2014 TED talk, in which he laid out his goal of “eliminating human disability through technology.” It combined scientific advancement with raw human emotion, as Haslet-Davis couldn’t hold back the tears before, throughout and after her first on-stage performance since the attack. “Oh, my gosh, [I was feeling] every emotion possible,” Haslet-Davis recalled. She was handed the competition’s blue ribbon hours later. She attributes the win to a “100 percent” change in her perspective on dance and how she approached the sport. Now, it’s spring in Boston once more. The snow has melted from the city’s famed cobblestone streets, the banks of the Charles River are green and blossoming, and the annual banners counting down the days until the marathon have been hung proudly for all to see. On Monday, Haslet-Davis will be one of roughly 25,000 runners to line up at Mile Zero on Main Street to twist and turn through a series of quintessential New England towns before, eventually, rounding the corner onto Boylston Street around Mile 26. For Haslet-Davis, the decision to run is not only a symbol of recovery, not only a symbol of redemption, but also one of resolution. Of higher and higher goals set, of pushing herself to do more, conquer more, take advantage of every day more. She gave herself six months to train for the 120th Boston Marathon. That limited time frame in itself would be an unthinkable, insurmountable hurdle for most anyone. And soon enough, simply giving running a go turned into training for the 26-mile safari through Eastern Massachusetts — despite the fact that she had never really run prior to the attacks. So she began the early morning workouts and the regimented schedule, and through the grit, grind and miles tallied, she’s discovered a string of connections between long-distance running and ballroom dancing that she had never before imagined. More important, Haslet-Davis also discovered how she can use the mental strength she acquired throughout her recovery process to inspire herself to keep training. And how, in turn, she can use her marathon training to help her through the trials of her post-traumatic stress. “[My post-traumatic stress] can be debilitating at times, but it’s about understanding that and letting yourself rest and letting yourself have time, and being able to say, ‘I can’t do it all,’ then moving on and showing up and pushing through,” she added. She’s running on behalf of the nonprofit Limbs for Life, raising money — over $10,000 so far — to provide prosthetic limbs for those that need but can’t afford them. Looking ahead to Marathon Monday, Haslet-Davis is proud to say that while she does have some nerves heading into the race, they’re almost all “running-related” — fears any participant would have, not just one who experienced the horrors of 2013 firsthand. 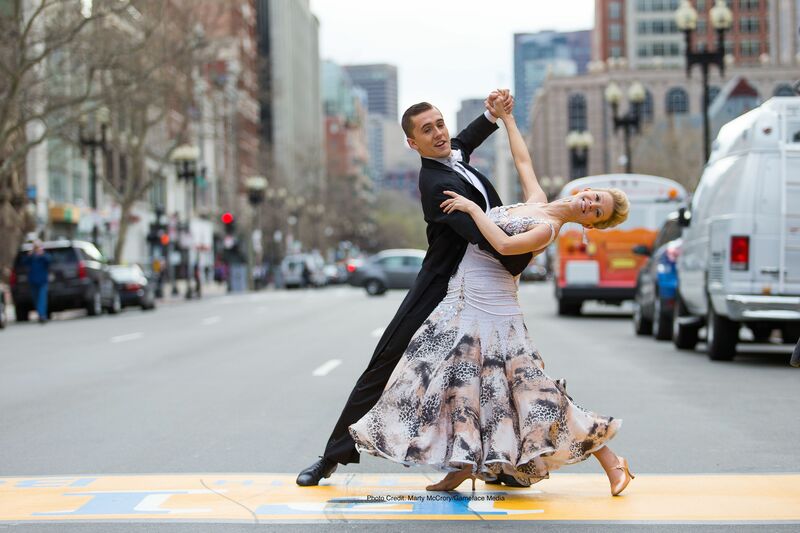 Haslet-Davis danced over the Boston Marathon finish line as part of the “Heroes of Summer” campaign in April 2015. Haslet-Davis pauses for a moment here, reflecting on Obama’s remark. She agrees that we shouldn’t allow anyone to scare us into submission. But based on the lessons she’s learned in the past 36 months, the trials she’s gone through, the hurdles she’s crossed, she adds one caveat to the president’s words. However, Haslet-Davis is doing anything but cowering in the face of that fear. She is careful to delineate the difference between being a victim and being a survivor. And she firmly considers herself the latter. As for what she expects to feel when she crosses the finish line on Boylston Street on Monday?